Esmeralda Valerio is a junior from Chicago studying social work. She is a Harvey and Trish Welch Scholarship recipient. I chose SIU because it felt like home. I felt I could make some sort of impact on this campus and I am glad I have. I’m making my impact by working with New Student Programs. Having to work with other social workers growing up. Being part of the New Student Orientation as a team lead. I brag about how proud I am to be a leader on campus through our New Student Programs office. This scholarship helped me have peace of mind to not worry about my current financial struggles. The $1000 I received really did make a huge difference. 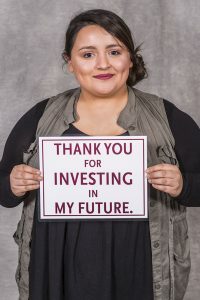 Because our students have heart, they are passionate for their institution and what SIU does to impact its students. I would use it to create a scholarship for first generation Latinx students who struggle with physical or mental disabilities.